3 doc. 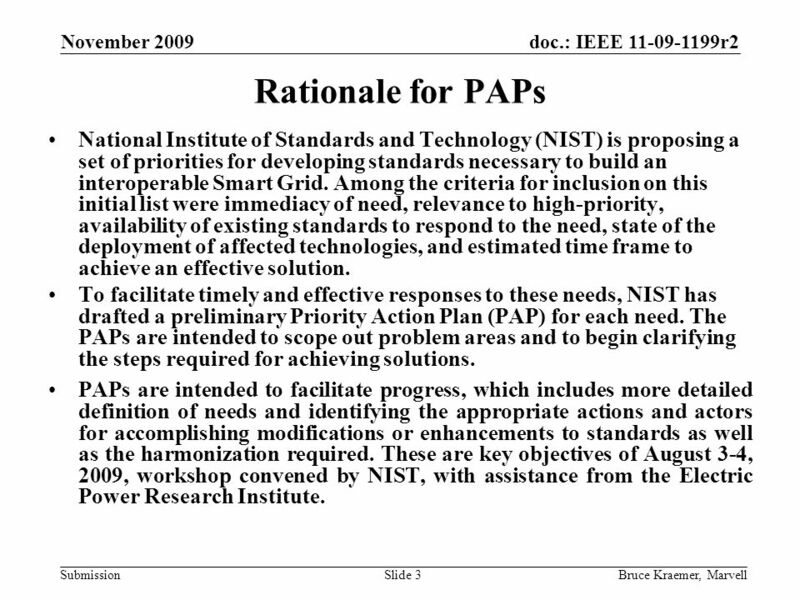 : IEEE 11-09-1199r2 Submission November 2009 Bruce Kraemer, MarvellSlide 3 Rationale for PAPs National Institute of Standards and Technology (NIST) is proposing a set of priorities for developing standards necessary to build an interoperable Smart Grid. Among the criteria for inclusion on this initial list were immediacy of need, relevance to high-priority, availability of existing standards to respond to the need, state of the deployment of affected technologies, and estimated time frame to achieve an effective solution. To facilitate timely and effective responses to these needs, NIST has drafted a preliminary Priority Action Plan (PAP) for each need. The PAPs are intended to scope out problem areas and to begin clarifying the steps required for achieving solutions. PAPs are intended to facilitate progress, which includes more detailed definition of needs and identifying the appropriate actions and actors for accomplishing modifications or enhancements to standards as well as the harmonization required. These are key objectives of August 3-4, 2009, workshop convened by NIST, with assistance from the Electric Power Research Institute. 4 doc. 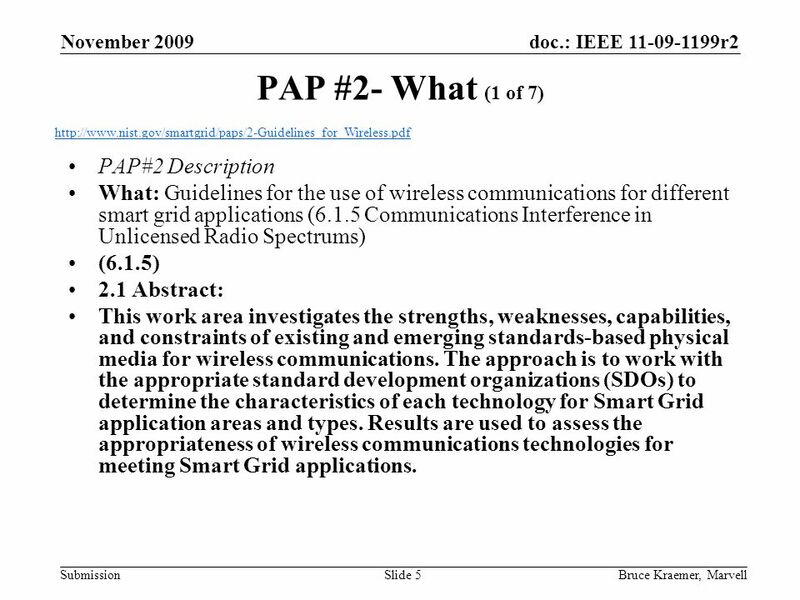 : IEEE 11-09-1199r2 Submission November 2009 Bruce Kraemer, MarvellSlide 4 PAP #2 2 What: Wireless Communications for the Smart Grid (6.1.5) 2.1 Abstract: This work area investigates the strengths, weaknesses, capabilities, and constraints of existing and emerging standards- based physical media for wireless communications. The approach is to work with the appropriate standard development organizations (SDOs) to determine the characteristics of each technology for Smart Grid application areas and types. Results are used to assess the appropriateness of wireless communications technologies for meeting Smart Grid applications. 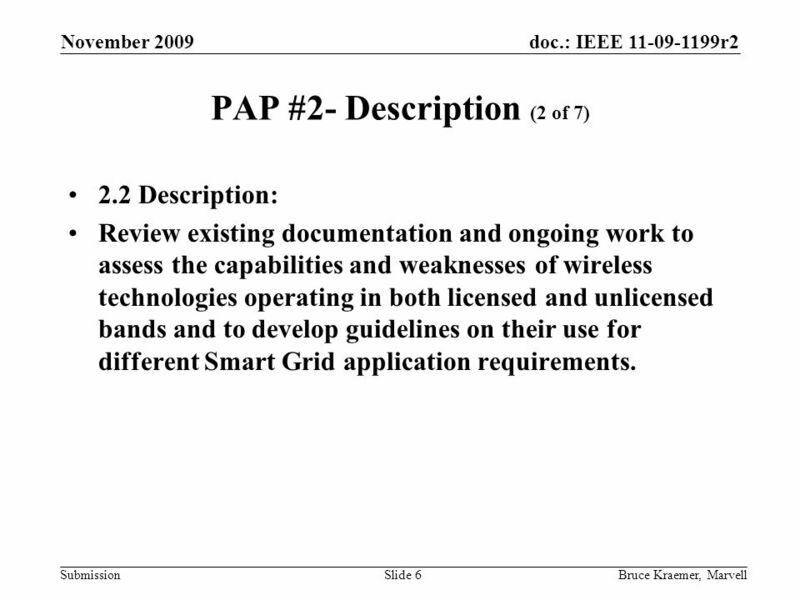 2.2 Description: Review existing documentation and ongoing work to assess the capabilities and weaknesses of wireless technologies operating in both licensed and unlicensed bands and to develop guidelines on their use for different Smart Grid application requirements. 2.3 Objectives: Identify requirements for use of wireless technologies for the Smart Grid. Identify guidelines for effectively, safely, and securely employing wireless technologies for the Smart Grid. Identify approaches to define the strengths and weaknesses of candidate wireless technologies to assist Smart Grid design decisions. Analyze co-channel interference issues and develop coexistence guidelines for operation in unlicensed bands. Identify key issues to be addressed in wireless assessments and development for the Smart Grid. 2.4 Why: Wireless technologies are one of many types of media that could meet many Smart Grid requirements by enabling access where other media are too costly or otherwise not workable. However, different types of wireless technologies also have different availability, time-sensitivity, and security characteristics that may constrain what applications they are suitable for. Therefore, different wireless technologies must be used with knowledge of their varying capabilities and weaknesses in all plausible conditions of operation. This work provides objective information on the appropriateness of use. 6 doc. 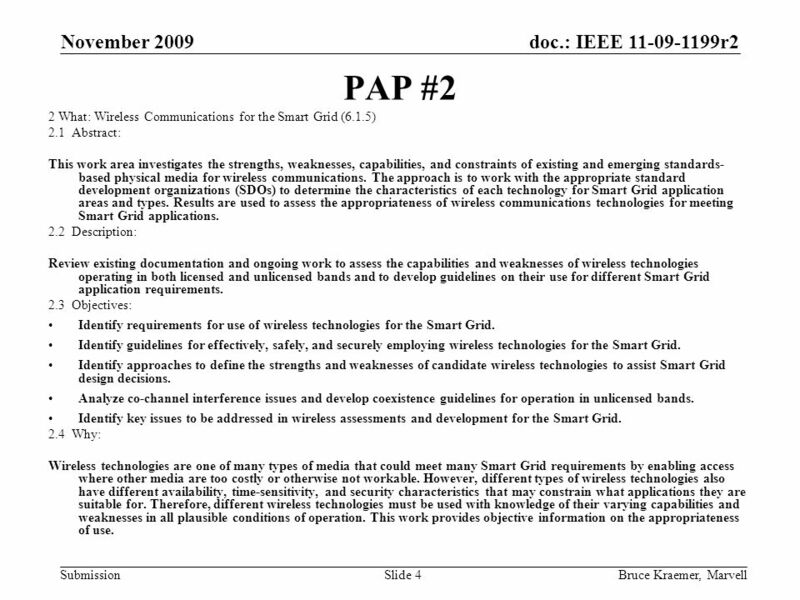 : IEEE 11-09-1199r2 Submission November 2009 Bruce Kraemer, MarvellSlide 6 PAP #2- Description (2 of 7) 2.2 Description: Review existing documentation and ongoing work to assess the capabilities and weaknesses of wireless technologies operating in both licensed and unlicensed bands and to develop guidelines on their use for different Smart Grid application requirements. 7 doc. 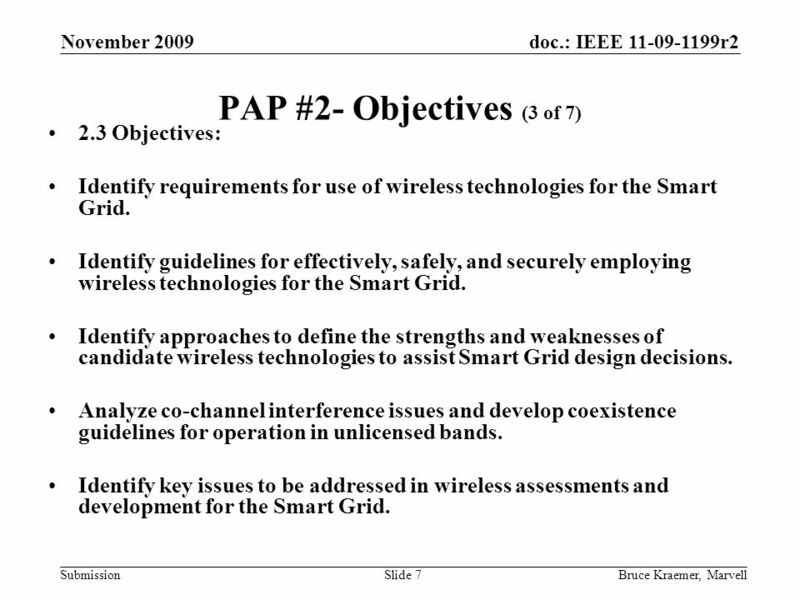 : IEEE 11-09-1199r2 Submission November 2009 Bruce Kraemer, MarvellSlide 7 PAP #2- Objectives (3 of 7) 2.3 Objectives: Identify requirements for use of wireless technologies for the Smart Grid. Identify guidelines for effectively, safely, and securely employing wireless technologies for the Smart Grid. Identify approaches to define the strengths and weaknesses of candidate wireless technologies to assist Smart Grid design decisions. Analyze co-channel interference issues and develop coexistence guidelines for operation in unlicensed bands. Identify key issues to be addressed in wireless assessments and development for the Smart Grid. 8 doc. 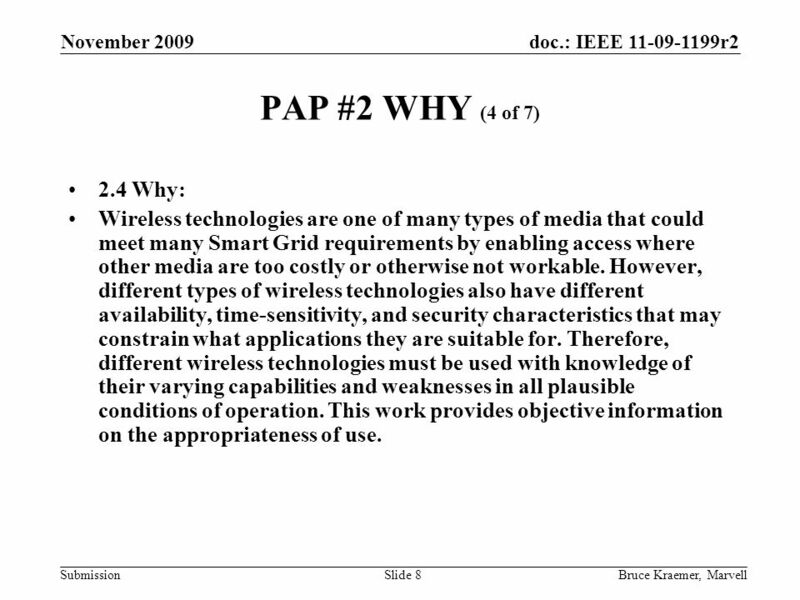 : IEEE 11-09-1199r2 Submission November 2009 Bruce Kraemer, MarvellSlide 8 PAP #2 WHY (4 of 7) 2.4 Why: Wireless technologies are one of many types of media that could meet many Smart Grid requirements by enabling access where other media are too costly or otherwise not workable. However, different types of wireless technologies also have different availability, time-sensitivity, and security characteristics that may constrain what applications they are suitable for. Therefore, different wireless technologies must be used with knowledge of their varying capabilities and weaknesses in all plausible conditions of operation. This work provides objective information on the appropriateness of use. 9 doc. 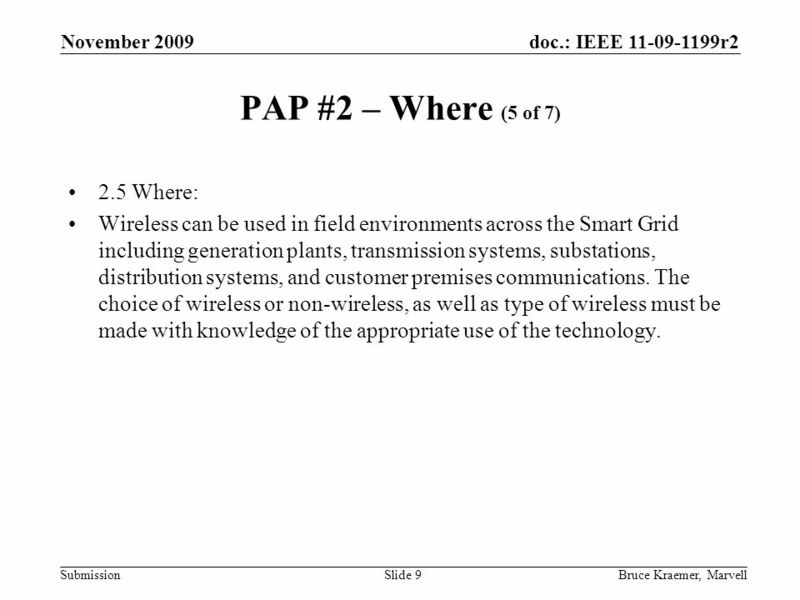 : IEEE 11-09-1199r2 Submission November 2009 Bruce Kraemer, MarvellSlide 9 PAP #2 – Where (5 of 7) 2.5 Where: Wireless can be used in field environments across the Smart Grid including generation plants, transmission systems, substations, distribution systems, and customer premises communications. The choice of wireless or non-wireless, as well as type of wireless must be made with knowledge of the appropriate use of the technology. Download ppt "Doc. 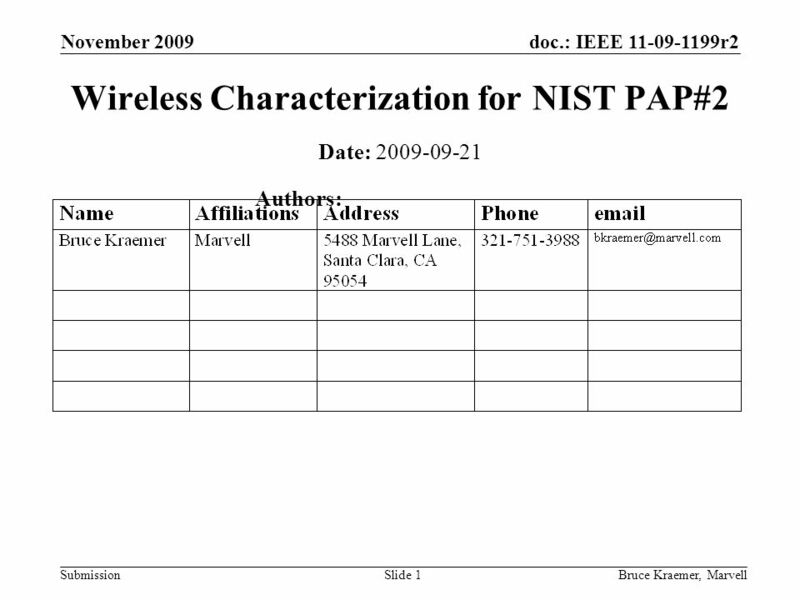 : IEEE 11-09-1199r2 Submission November 2009 Bruce Kraemer, MarvellSlide 1 Wireless Characterization for NIST PAP#2 Date: 2009-09-21 Authors:"
ITS RADIO SERVICE (DSRC) SECURITY T. M. Kurihara, Chair IEEE P1556 Working Group August 22, 2003. Doc. : IEEE /0647r0 Submission May 2010 Bruce Kraemer, MarvellSlide 1 +1 (321) Marvell Lane, Santa Clara, CA, Name Company. Doc. : IEEE /265r0 Submission June 2001 Robert F. Heile, Consultant Steve Shellhammer, Symbol Technologies Slide 1 IEEE P Working Group for. Doc. : IEEE g TG4g - SUN November 2009 Phil Beecher, Beecher Communications Consultants Ltd Slide 1 Project: IEEE P Working Group. Doc. 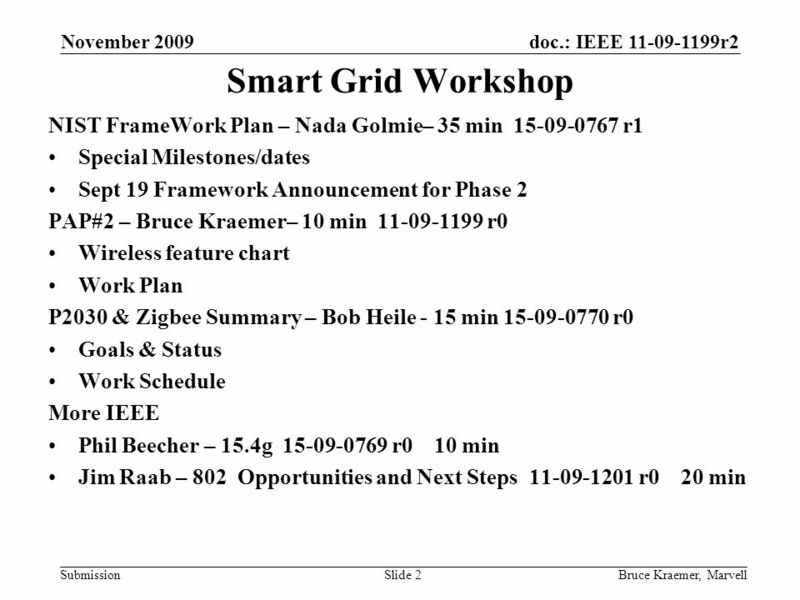 : IEEE 802.11-11/1340r0 Submission September 2011 Bruce Kraemer, MarvellSlide 1 Smart Grid SC–Closing Report- September 2011 Date: 22 September 2011.